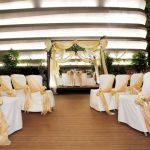 Royal Plaza on Scotts introduces a brand-new event space, Scotts Suite – a versatile oasis located at the second level of the hotel and sits above the bustling city life with a stunning alfresco balcony view overlooking the busy street of Scotts Road. Experience the flexibility of Scotts Suite with numerous options for event set-ups that can accommodate up to 80 persons, and full-length glass windows that allow for natural light to brighten the space in the day and city lights from the vibrant streets at night. Adjacent to the main event space is Scotts Lounge, a common area for all to come together for hearty buffet spreads or mid-afternoon coffee breaks provided by the culinary team behind the award-winning buffet restaurant, Carousel. Two breakout rooms, equipped with large meeting room tables and chairs, are conveniently located within the area and easily accessible for group discussions. The outdoor space at Scotts Suite features a charming gazebo, set in a thoughtfully designed zen-inspired outdoor garden, which is great for intimate social ceremonies such as weddings, solemnisations and celebrations with close family and friends. Play the perfect host to your guests with help from the experienced M.I.C.E. team at Royal Plaza on Scotts, who will provide you with assistance to ensure a smooth delivery of your event from start to finish. 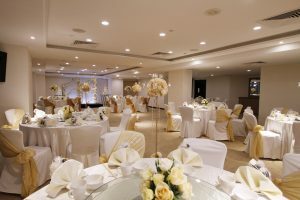 An event space that accommodates a wide variety of event set-ups in the day and at night and is steps away from major shopping malls in the iconic Orchard shopping district, Scotts Suite is an all-around event venue for the next team off-site meeting or social reunion that also offers an unparalleled convenience to an endless array of dining and entertainment options.